The Grand Massif is a vast area, which has something to offer all standards. It is reasonably snow sure with a lot of the skiing above 2000m. 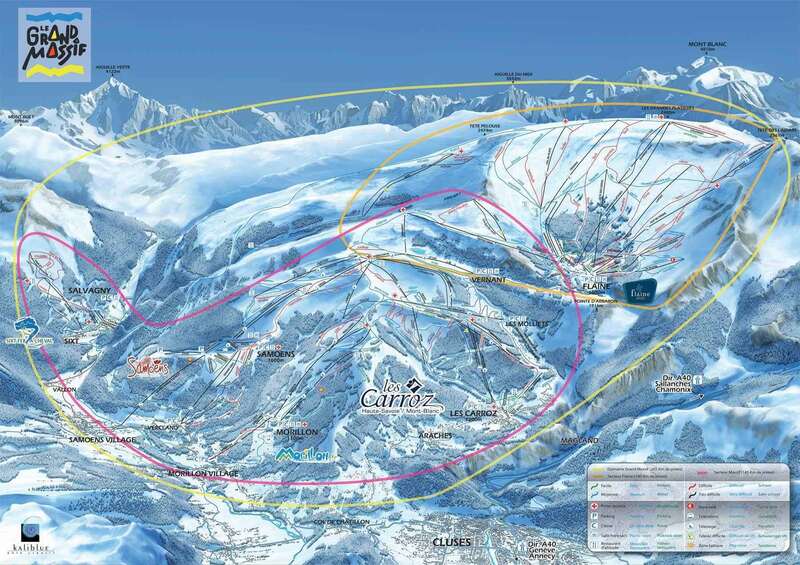 Flaine, which is purpose built and unattractive, is the centre of the skiing and the resorts of Les Carroz and Samoëns are satellites with good connections. Les Carroz is a traditional village surrounded by wooded slopes and has a relaxed French atmosphere. It is family orientated and offers plenty of extra activities, including tobogganing, floodlit skiing, hot air ballooning and a cinema. It is not noted for its night life but has more than enough bars and restaurants and even has 3 discos. Samoëns is on the other side of the mountain from Les Carroz and most of its slopes are north facing. It is the only ski resort listed as an historical site and has a glorious feel of the slow pace of the countryside. It maintains many of the old traditions, including a weekly market on Wednesdays in the medieval square. Samoëns itself is not connected directly to the skiing but there is a frequent free bus to the lifts.